A wet saw may seem like an overwhelming, large and complicated tool. In fact, it is one of the easier professional tools for beginners to master. It cuts tiles quickly, consistently and cleanly. However, a quality wet tile saw can be expensive and hard to come by in a hurry. If tile needs to be cut without a wet tile saw, then there are a few options to consider depending on the size of the job and the tile. If only a few ceramic tiles need to be cut, a glass cutter and a wire hanger can be used to get a clean, precise cut. Mark the tile where it needs to be cut. Guide the glass cutter along the line using a square guide to score the tile. Place the scored line on the surface of the tile over the wire hanger rod and press down. This will help to make a clean line when the tile breaks. Use sandpaper or a rough concrete surface to smooth down any rough areas. This can be done with large or small tiles. However, if attempting to complete an expanse of tiling, this process will take a significant amount of time to complete. A carbide-tipped pencil and a straight edge can also work well on certain tiles for small repair jobs or craft projects. For larger jobs, there are a number of tools that can make quick work of cutting tiles without a wet saw. A manual tile cutter works well for larger tiles, doesn't require electricity and is simple to use. An inexpensive pair of compound tile nippers assists in getting corners and curves just right. A cut-out rotary tool has a wide range of applications for cutting both large and small tiles for edging and trim. These will cut down on the time needed to complete a job compared to cutting tiles with small hand-held blades or tools. 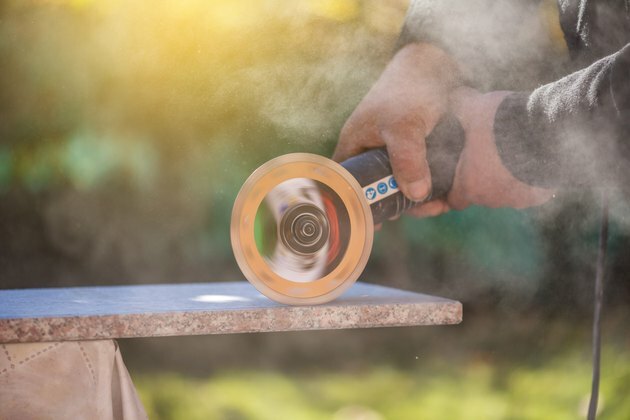 The benefit of using a wet saw when sizing tile for a project is that it significantly cuts down on the amount of dust and/or fibers that cutting tile can create. When cutting tile without a wet saw, always wear a specialized respirator mask for small particles. The tiny particles can cause an itchy throat, can cause eyes to redden and swell or can cause a cough if they are inhaled. The floating fibers can also lodge in your eyes, so wear protective eye gear that wraps around the sides of your eyes. Gloves will protect fingers and palms from accidentally getting sliced while handling slick tiles and sharp cutting tools. A few tile-cutting tools should be within easy reach before getting down to the dirty business of tile installation, such as a utility knife, straight edge or square, leveler and pencils or chalk-line markers. If you know what tiles you need to have cut, there are a few options to have someone else do the messy work of precisely cutting tiles down to size for you. Mark all the tiles before heading to a tile-cutting service. Have a few extra tiles marked for backup in case the tiles break during cutting or for later on when you are on your hands and knees and a tile cracks during installation. The tile-cutting service at Lowe's or other big box home improvement stores may cut tiles you have purchased elsewhere. Call ahead to make an appointment, if applicable, and check that they will cut the tile you have. If you purchase the tile at a hardware or chain store, ask in advance what cutting options are available to you.